The roller coaster of grief continues, although right now I am at the highest point. It’s difficult to comprehend the mixed emotions I am currently feeling. I am still broken, but I think the pieces are slowly coming back together. Bella often talks about love. She says that “love is the answer” and “love will heal all.” I know that Bella is referring to much bigger things (like the state of the world), but it can also be applied to my current state. Love is the answer to how I will heal my broken heart! It will never fully heal, but the process has definitely begun. After all that I have been through, it seems foreign to feel happiness. It’s so easy to let the positivity take me away, and because I am capable of feeling it, I have decided to give in to it. I am allowing myself to be happy. I am purposely taking a break from healing, which in itself IS healing. It takes a lot of hard work to cope with grief. It’s a challenge, and every day is different. It’s also a lot of work to remain happy, especially when there’s a huge hole in your heart. When love finds you, it’s ok to let it fill that hole. Love has found me, and for that I can thank Bella. She led love to me. This morning I lay in bed with a huge smile on my face. It seems impossible for someone to be so happy yet so broken at the same time. Bella has been sending me gifts and I’m trying to soak it all in. We celebrate birthdays as a way to celebrate the day a person was born. It’s not about celebrating becoming older. It’s not about cake or presents. Somehow the concept of what a birthday is got spoiled and the true meaning was lost. A birthday is for parents to celebrate the day they became parents. The anniversary of the best day of 2 peoples lives as they welcome a new life that they created. It’s so sacred! A birthday bash for my daughter may be very selfish. I’ll admit it… This birthday bash is more for Bella’s father and me than anyone else. All I ask is that people please respect this. The day Bella was born was the best day of my life. I’m sure Shawn would say the same thing. I was approached by an amazing person who wrote a song for Bella and wanted to hold an event to play this song for us, and suggested that any money raised be donated to us. This was a beautiful gesture, but the thought of us getting money didn’t sit well, so I began researching ideas of what I could do with any money raised. I found a pink park bench and knew I had to get one for Bella. Bella is still very much alive. I am serious when I say she talks to me. My psychiatrist knows she talks to me and his report states that I am not crazy! She tells me how much she appreciates what I am doing for her and is actually very excited about her party. She may never be “2 years old” but her birthday will always be the anniversary of the best day of my life. To Bella, she is not dead (and does not like when I say that word). Bella transitioned to a higher dimension. She is HERE and continues to be ALIVE, just not in the physical 3rd dimensional world we perceive. Bella wants to redefine “death” to help humans understand that it’s not at all what we perceive it to be. 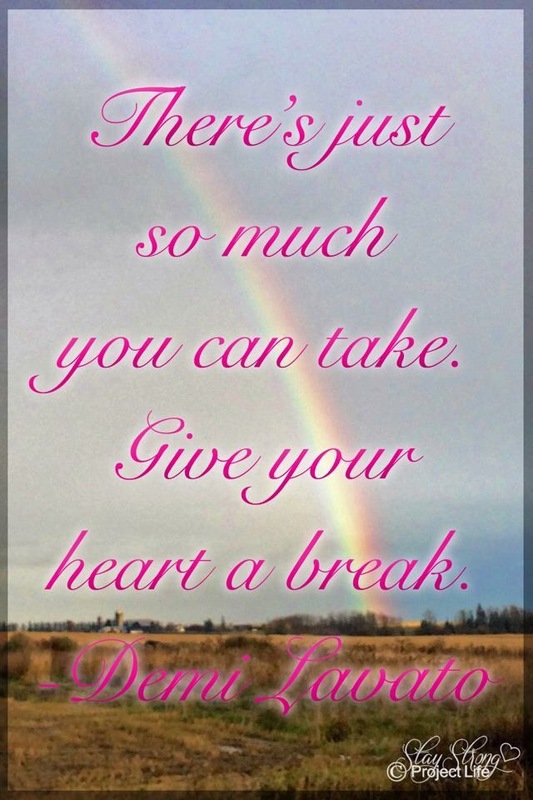 The rainbows I see everywhere I go, rocks I find in strange places, and odd things that occur on a daily basis, are all signs from Bella, my guardian angel, making sure I KNOW that she’s here with me. Yesterday she sent me a song to tell me that I am “never alone” (Lady Antebellum) and the lyrics of that song are very real to her and I. This “birthday bash” is a party for Bella’s father and I, our families, friends, and anyone else who wants to be a part of it. It’s a pub, a party for adults, a celebration our angel. All is calm and quiet. I hear the water trickling in my fish tank, the empty tank that used to be our pet Jerry’s home. He is now Bella’s pet fish and I’m sure she’s loving the extra company. Things here are at a standstill. I am digging myself back out from this hole yet again. It doesn’t take much to set me back. Negative encounters drain me and lower my frequency. This causes me to isolate myself. When my frequency is down, Bella has a difficult time communicating with me. Despite that, she continues to make her presence known. She always finds a way to get through to me. Bella has been visiting several of my friends, some who didn’t believe she actually communicates with me. They are now believers! I am convinced that my daughter is going to reshape the way we perceive death. She is not dead and although I continue to use that term, I have a hard time saying it because I know different. Bella is very much alive! She is happy and well. Even though I know she is always here with me, I will continue to go through the process of grief. It’s necessary and is the only way I’ll ever be able to heal. Spiritually, she is here with me, but physically, I am still missing her, that piece of me. 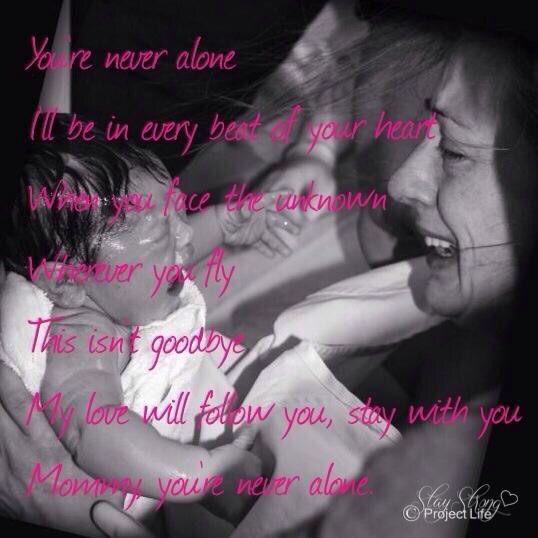 When you lose a child, a piece of you really does die along with them… And she’s correcting me as I write this. Her version is “as I transitioned, I took a piece of you but that’s because humans are limited in what they can perceive.” She says there are entire worlds beyond what we can see. She chose me. For that I am blessed. I’m meant to experience losing my child and I know her reasons for choosing me. I’m doing the best I can under the circumstances and she is doing her best to help me. She sends me gifts, many of them, and it’s constant! She wants me to be happy because she can feel me when I am happy. My daughter has just sent me the best gift anyone has ever given me. I have never felt so sure about anything in my life. The last few days have been so up and down. There’s so much more that comes along with losing a child which most people wouldn’t think about. So much that still needs to be done that I can’t bring myself to do. Preparing to do these things brings so much sadness that I have to stop. Things like canceling her health card and sending her death certificate to wherever it needs to go. The mere sight of that paper yesterday was enough to send me into a whirlwind. Everything becomes difficult when you lose a child. 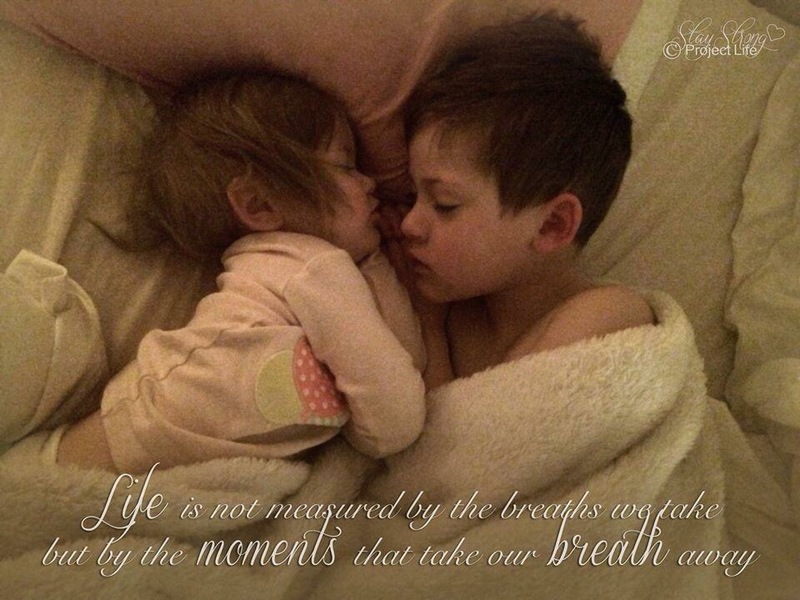 Sometimes even your reflexes stop and reminders are needed to make sure you breathe. But the last few days have also been filled with excitement as I plan Bella’s birthday party. It seems strange that planning her birthday bash would bring me joy, but anything I can do for her fills me with love and happiness. She tells me she is happy I’m doing this for her and she’s excited about her party. Her doll always talks while I work on anything to do with her party. I’ve continued to write every night, but the things I’ve been writing about are not things I can post. There is so much that is not known to others, and as open and honest as I am in my posts, honestly there are things that the public will never know about. This is for no other reason than respect for others and wanting to protect them. Sometimes our “story” is not ours to share. Someday I may share it, most likely in the books that Bella tells me I will be writing, but for now my life remains a complicated mess on the inside and is masked by the fact that I just lost my daughter. Reality is this mess existed long before she left. I wish more people would appreciate what they have. Even the bad times. Appreciate every moment because not everyone has those opportunities. Life was not easy before Bella transitioned, but nothing compares to this. I would give absolutely anything to be sleep deprived again. I want my chaotic life back! Parenting is hard work and some people aren’t fortunate enough to experience the difficulties that go hand in hand with the joys of parenting. Complaining about the challenges doesn’t help anyone. I’m just as guilty as every other parent out there. I was a single parent of 2 kids for a year. 4 months of that year I was still on maternity leave, and then I became a full time working single mother of 2 with a side business. Busy is an understatement. Despite the challenges I faced, I made a point of capturing at least one “happy moment” every single day. When I look back at the pictures of my hectic life, I see only happy memories. These are the moments I will remember for eternity. Sometimes parents get overwhelmed. It happens to the best of us, and it’s ok to get frustrated. It’s how you handle those frustrations that matters. It’s about where you choose to focus your energy. To those parents who don’t get to see their kids every day, remember to make the most out of every moment you do have, and do your best to have as many moments as possible. That’s what counts! Every parent’s worst fear is for something terrible to happen to their child. We all do the best we can to protect our babies, but reality is sometimes bad things happen. Unexplainable things. Tragedies that tear us apart at our core. This past June 28, the unimaginable happened to us when our baby Bella left this world. Bella was 19 months old. A very special spirit, she touched everyone who ever came into contact with her. She had depth to her soul that no child could possibly possess. She was here for a reason and now it’s up to us to fulfill her purpose and keep her memory alive. When a child dies, everyone around that child is affected. It shook the ground in our small community and friends and strangers from all over have reached out to us to show their love and support. We could never express our gratitude as words are insufficient, but know that it has touched us in ways we never knew existed. Now that she is gone, it is up to us to keep her memory alive and in order to do that, we need your help. We plan to build a memorial for Bella in a local park. Plans include a pink park bench, flower pots, and hopefully an oak tree (the acorns are currently sitting in soil mixed with Bella’s placenta and ashes – a tree of life). Anything extra will be going towards improving Larder Lake’s playground. Please note that a Birthday Bash to celebrate Bella’s 2nd Birthday will be taking place on November 15 in Kirkland Lake, featuring 3 very talented local bands to help us raise money. Space will be limited. Details will be posted soon. Click HERE to donate to Bella’s Memorial Fund. It’s morning. I’m still in bed and it’s after 8 am. I came back to bed but of course I can’t sleep. I need my ME time and when you’re surrounded by family, it’s hard to come by. I’m with my sisters again. We decided to come south for the weekend. Our drive yesterday filled me with blessings. I feel blessed that Bella chose me to be her mom. She may have left but comes to me every single day in some form (Bella corrects me and reminds me that she didn’t leave, she transitioned, and this was her choice). She keeps giving me gifts. Love, hope, and understanding. I struggle to understand why I’m receiving these gifts from her because I feel that as a grieving mother, I should be feeling pain and anger, but instead I am so full of love today. It’s not always this way. This is the roller coaster of grief. I never know from one day to the next what emotions will consume me but I am forced to accept what is. This is my reality. This is grief. I am thankful to have days of overwhelming positivity, as yesterday brought to me. On our way here, we stopped at the mall in North Bay and I found 2 Christmas ornaments for Bella. One will be Bella’s hand print, and the other is an angel drawing a rainbow. 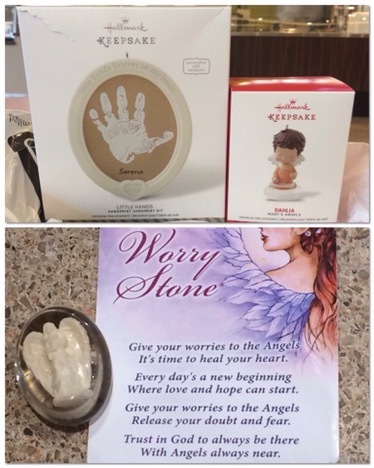 I was overflowing with love as I found these, as well as an angel “worry stone.” Rocks and rainbows have so much meaning to Bella and I. I will continue to use rocks to give my worries to my angel, my Bella. It’s amazing how intense my connection to Bella is. It’s such a strong bond that not even death can separate us. She comes everywhere with me and constantly gives me signs. I now know why she sends me rocks, and now I also know why she sends me rainbows. She is a rainbow child. Even though our time together in the physical realm was short, Bella will never leave my side. My rainbow child will continue to fulfill her life purpose, which is something she could never do in life. As her mother, it is my job to help her get her messages out. Maybe the time has come to share. I can’t help but wonder how they will be received.